Yeah, without the chest display that robot could be just about anything from innocent to curious to lost. The chest plate display gives it loads of evil personality. Love it! I like how the Mad Scientist isn't decked-out in gear......or wearing a lab-coat.......or an old man......essentially she's very refreshing and practical-looking. Nice that you chose an oni for the Brute. Though with blond hair and pink skin I keep imagining he's some sort of evil surfer dude. Actually wooden sandals are very traditional Japanese. I just want to say, that I had this tattooed on my ankle, I want to thank Darren so much for the inspiration for this piece. Absolutely amazing Monkey!!! I want more monkeys like this around my legs. SilvercatMoonpaw wrote: I like how the Mad Scientist isn't decked-out in gear......or wearing a lab-coat.......or an old man......essentially she's very refreshing and practical-looking. I just have to say that I love your art style. It fits in very well for both 4 color or anime styles. I particularly liked your mad scientist and Imp art. Its nice to see a girl genius since mad scientists are usually portrayed as old men. Ha. You're a braver man than I am, StoryinInk. Man, I can't believe I originally posted Gun Monkey 6 years ago. Anyone else getting a Kaylee from Firefly/ Serenity vibe off of the Mad Scientist? So that's why I like that picture so much! There was something familiar about that girl that I couldn't put my finger on until now. I liked Kaylee as well since she feels like a cute little sister to have around. Still its nice to see a nice looking female gadgeteer. Now if I can only see a good looking female overlord like Royal pain from the sky high film. But with so much evil in those eyes! 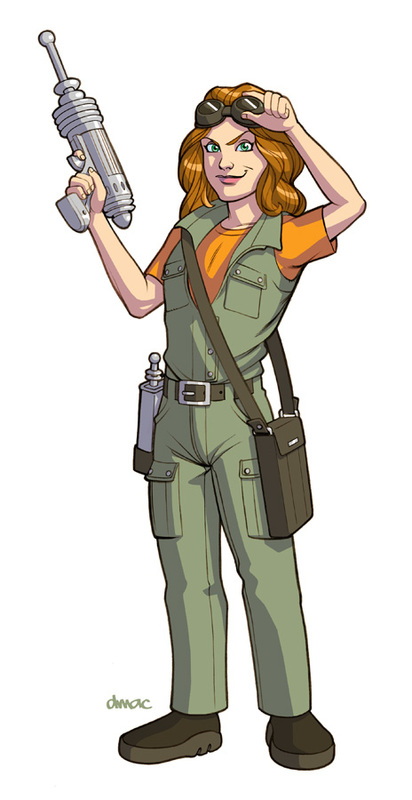 I like the kind of more modern sci-fi design of her overalls mixed with the more retro design of her raygun. Another top-notch piece! Great work in here man!